It’s a lovely sunny morning, I have nowhere to go and nothing I have to do (aside from housework, but that’s easy enough to ignore), and it’s just about time for my second cup of tea. Life is good. Well, except for that whole thing about how very soon our country will be controlled entirely by a bunch of rich white guys who are determined to block any legislation that might help people who are not (straight, Christian) rich white guys. In less soul-destroying news, the Chosen publishing process is moving along nicely. An artist has been commissioned to design the cover, and I’ve had a review copy of the book printed up so I can press my nose up to the pages and scent out any typos, errors, or gaping plot holes as of yet undiscovered during the writing and editing process. In related news, I’m currently looking for bloggers or fellow authors who would be interested in writing review blurbs for the book. 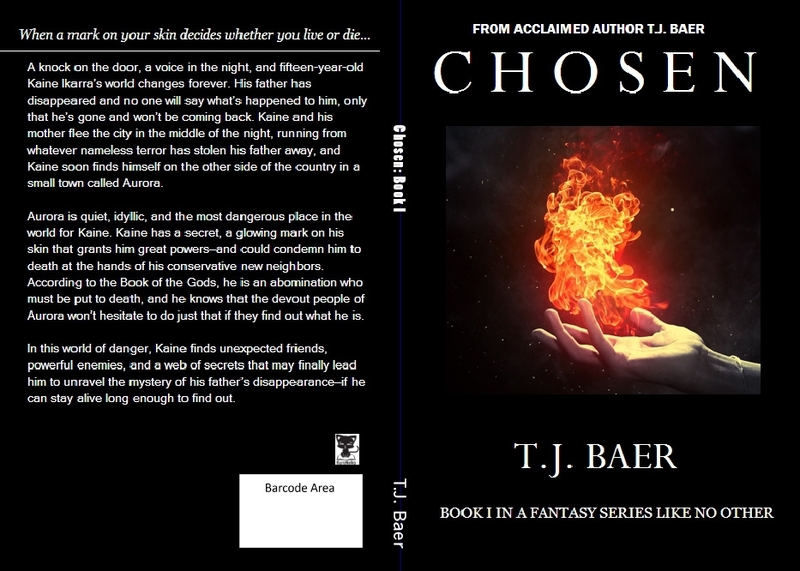 If you’re interested (or know someone who might be), drop me an email at tjbaerwrites@gmail.com. I’ll send you a free electronic copy of the book, and your review blurb will be included here on this site (and also possibly on the front or back cover of the book). In case you’re not sure what to write, might I suggest one of the following? Okay, not really. But any of the above will certainly get you a queen-sized helping of brownie points.